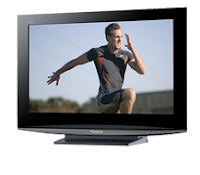 I had read great reviews of the Panasonic TH-42PX8A 106cm HD Digital Plasma, especially its ability to display SD in HD as my DVD-R will only be playing back SD. Getting one for around $1300 looked achievable onine. After finally tossing out the need for 1080p (even though I have a PS3), I just needed a decent 80cm HD TV for under $1000, hopefully ~$800. I went in to Clive Peeters with the plan, get them to drop the price of either one of these to my target and I'd walk out the store a happy man. For all my use of the internet I'd still rather talk with a real person when it comes to deal time. I want them to look me in the eye and say it's a good deal, and assure me that it's going to last a while. That to me is more important than a bit of paper for warranty. If someone wants to stick their reputation on the line with the sale, then I'm happy to trust them. The plasma price was almost there at $1450, but no 80cm LCDs under $1100. Eventually got the price of the plasma to $1300 and was almost settled on it when I looked a little harder at the screen. It was playing back some NTSC American Football review and was shearing all over the place. I got him to hook up the normal terrestrial signal to see what it was like and it too didn't cope very well. It got better when you went ~3-4m away, but I lie on a matress in front of the TV only ~2m away. It might be a great 106, but useless to me. Panasonic VIERA TX-32LXD80A 80cm knocked down to $970. It looked great, fit with the DVD-R, but just a little expensive. Hunted around some other stores but couldn't get anything near that price, so I picked it up with a moderate smile on my face. Grabbed the PS3 from Mark's on the way home as well as 2 HDMI cables to complete the setup. Plugged it in and set it up straight from the antannae first to test HD. It's a dream. Sweet crisp picture, no artifacts, good on movement. Oddly enough the difference between SD and HD was mainly noticable through the sound; the picture was great on normal SD. I then plugged in the DVD-R through HDMI and set up the VIERA link. The signal comes through the same from normal SD channels, but was a little lossy from playback. Might have to set the recording level up a notch now that I have a TV that can handle it. Sound was great too, but VIERA link was a little gimpy. Yes you could control the DVD-R from the TV remote, but not nearly as easily as from its own remote. It will be convenient if you can't be assed getting up to get the other remote, but if they are both within reach it's a waste (much as I thought). Watched a couple of hours of normal tellie and was really impressed. It was better than I was expecting and the system was working wonderfully together. I had the stereo running off the TV now instead of from the DVD-R, so no matter what I'm watching, be it HDTV, SD thru DVD-R, DVDs, DivX, or PS3, it can all be heard properly. Now I have a real incentive to set up the satellite speakers. Next I set up the PS3. At first it failed to play any sound, but I'd fiddled with HDMI at Mark's for a comparison and it didn't redetect a new TV on the other end of HDMI. Kinda silly, wasn't that part of the point of HDMI? Anyway, didn't take long to get the PS3 to set up the link again and get it all working sweetly. GH3 in 720p was Ok, but there were some noticable jaggies like there wasn't any anti-aliasing. Might fiddle with 1080p to see if it cleans it up through an upscale and downscale. Since the PS3 had been sitting upstairs for the past 2 months it also hadn't been connected to the net, so of more concern was the 50 minutes lost to automatic updates. Bottom line: I love it. Thought I'd been forced a downgrade by the plasma, but I definitely made the right choice. The Goo is in my Head!